Last night's milonga had a busy floor for Sydney, the music was excellent - as always at this milonga - and dancers from beginners to those who had been dancing for 10 or more years was there. Sadly it was a handful of the more experienced dancers who were causing many of the problems. You can't blame beginners for stopping as they work their way through the steps they are bravely trying to master. A good leader can navigate around these couples knowing that they were once beginners and making allowances. You can blame dancers, some of whom teach, for stepping backwards into line of dance and stopping while they show-off numerous fancy moves from adornos to volcados... frequently with the woman kicking her foot up high behind her. It is the other leaders who have to navigate this kind of selfish dancing, hoping to avoid being kicked or stepped upon as they endeavour to get around the log-jams. Sydney has it's share of Petulant Princesses, concerned only that they show off their ability to kick high and quickly without a thought, frequently in poses that wouldn't look abnormal if they were wearing a bustle; and smug Helicopter Dancer Leaders who seem to think that doing numerous enrosques is the essence of the dance. They have every right to dance this way - at home or on a practice floor - but not where they are part of a line of dance at a milonga. I don't hold out much hope that most of these 'dancers' will acknowledge their selfish ways and mature into better leaders and followers, they already think they are at the top of their tree. It does intrigue me as to why some nights at some milongas the floorcraft is worse than it is on other occasions. Does it depend on the number of show-offs on the floor? Any ideas? We don't have to look any further than the handsome couples with salon championship titles who are sent abroad to teach what they know -- choreography for exhibition. This isn't helping social dancing in the milongas. It is increasing the number of dancers who do exhibitions on the social floor. under the disguise of social dancing. Certainly, bad floorcraft may be the result of inappropriate movements and/or bad manners. But let's not forget that good technique (eg. axis control, a sound embrace and "groundedness") plays an important role in effective navigation of the dancefloor. Some so-called advanced dancers haven't really mastered these essential skills. Floor craft, line of dance, posture, musicality, embrace etc, are endless debates and burning issues since I started tango in Sydney in 1998. Other than in sheer numbers, it doesn’t seem as though it has progressed. My abridged response...I agree with both Cecil and Janis, in that show tango steps are taught by visiting teachers because they look spectacular (btw only if executed correctly or we descend to the likes of DWTS or worst, as we believe, we know better) and are ‘sell-able’, rather than deciphering their appropriateness, translation and the consequences on the SOCIAL dance floor. These steps become sequences on the social dance floor hence impeding floor craft in more ways than one. Learn to adapt the steps rather than adopt – that’s a higher level skill to master. Another reason for bad floor craft is that we are spoilt for space- i.e. too much of it and we don’t know how to dance in line, or execute appropriate steps in a confined space - as some milongas in Buenos Aires. 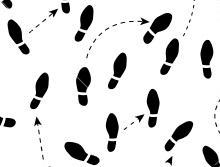 Whenever milonga floors becomes crowded, there seems to be a lack of manoeuvring skill, disregard for line of dance and concern for other dancers – how many of us have had near escapes with high voleos or even been hit. The three c’s come to mind, common sense, consideration and concern – these makes one a master of one’s craft. Use the corner of a room, place chairs to create approximately a 1.2X1.2 meter space. Dance with partner in this space, do not step blindly backwards, very short step OK. Corner walls makes one aware of elbows and arms. I have ever heard that in a milonga in Buenos Aires inappropriate dancers are requested to leave the venue by the the milonga organizer. Unlike Buenos Aires, Sydney has short history of tango culture. So it will be appropriate that the organizers take educational manner to hand a simple “Milonga code” paper to the dancer and give him a bit of lecture. Safety and happiness of the customers are the responsibility of the milonga organizers. 1, Do Not cut in immediate front of following dancers. 2, Do Not obstruct following dancers. 3, Keep the distance from surrounding dancers, particularly in front. 4,Do Not cross the floor. 5, No high boleos in a crowded floor. How I wish I had kept the very clever little flier that Tango Encanto created on floorcraft [note to self to ask them for a copy next time I see them]. It so succintly put the points of good floorcraft as mentioned by Yoshi above and needs to be distributed at every milonga! m I have with the Sydney scene is the lack of friendliness to visitors -or it it just shyness? I am sorry to hear that you find Sydneysiders unfriendly - I certainly don't believe it is shyness. As with any community people tend to form groups in which they feel comfortable and it is easier to stay within that group than to go out of their way to welcome and include strangers. People complain about certain 'crowds'in the tango scene and by this they mean cliques which can be unfriendly without meaning to be. Not sure what to do about it except perhaps acknowledge it and do what we (I) can to be friendlier.